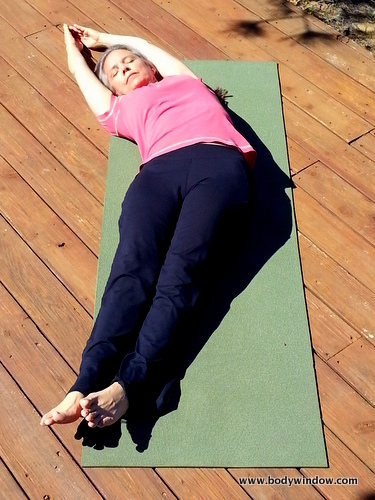 The Lateral Half Dragonfly Pose slowly opens your side body for Lung and Heart Meridian stimulation. The healing power of this pose is found through the awareness and understanding of the subtle body energy surrounding the movement of its chi (or prana). I find it very interesting that our modern culture requires the renaming of an ancient practice, so that we understand its original intent! The "yin" style of yoga is what I always thought was the actual, true practice. I learned and developed my own personal practice at home, without the influence of yoga studios, so I never really knew otherwise. It is a sad reflection of our current thinking that an ancient spirituality practice become merely a system of athletic movements. It is my desire, through my Yin Yoga series, that you are given the tools to return to the "true" yoga, yet still make it your own personal reflective and intuitive practice. The only way to deepen a yoga practice is to experiment and do it on your own, at home. 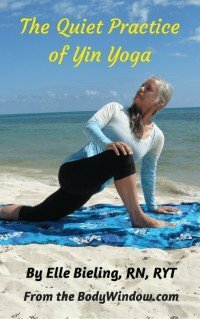 If you need the foundation of what is Yin Yoga, exactly, click the link in this sentence to become better grounded in it's principles, as it taught in the modern day. To begin, sit in the Half Dragonfly position, as shown in the first picture, below. One knee is bent and the other is extended. If you have open adductor muscles of the inner thigh, you can always chose to do this pose in the full Dragonfly position, with both legs extended. Since most of do not have open inner thighs, I chose the Half Dragonfly with one leg bent. Settle in here, and begin to notice your breath. Yin Yoga is a meditative practice, so conscious breathing is always the key to a most beneficial Lateral Half Dragonfly Pose. Now shift your weight through your hips, forward slightly, onto the bottom of your sitting bones, as you lean to your left side. Place your left elbow on your thigh, as you hold your head in your left hand. If you prefer, you can use a yoga block inside your knee to place your elbow instead. Stay at this first position for a few breaths and assess your body here. Is there a mild pull anywhere? Your side? Your lower back? Your shoulder? If there is, this is your first edge. Stay with this sensation until it releases. If the slight pulling does not release after a few breaths, this is your pose for the day. If your knees hurt, pad the knee under the extended leg with a cushion, blanket or small bolster. If after this modification, your knees still hurt, do NOT do the pose. If you feel an opening, you can take the pose deeper, as shown in the next picture, by raising your right arm over your head. If your right hip pops up, and your knee with it, go back to the previous pose. This will be enough of a stretch for you. Practice the art of self-loving-kindness when you do this pose. There is no goal at all to get as low as possible! Learn to be able to be present and happy with yourself and your body no matter where it lands! This is non-judgmental, self-love at its finest! This is the true practice of mindfulness! I love the saying from Matthew Sanford, a quadriplegic yoga teacher, who says, "I have been to the ground and back and God is not there!" What an amusing quote, yet so profound! Learning to release effort is the key to the sweet and gentle opening for healing, that a yin yoga practice brings! If, after practicing self-loving-kindness, you still find that you have room, or if room was created after a period of time, go ahead and release your head and place your left arm on the ground, and reach for your foot with your left hand. This deeper pose is shown in the picture below. The day that I did this pose for these photos, I was not as open as I usually am. I am barely reaching my toes. However, I chose to go with this picture anyway, because I know that this practice cannot and must not demand perfection in any way. You will notice, that from day to day, your body is different. You will never find it to be the same. Just as in life, we must go with what is, instead of always trying to achieve perfection, to the detriment of our souls! Accepting what is, is a mindfulness practice that your Yin Yoga poses can teach you! Especially with the more difficult Lateral Half Dragonfly Pose. We have already addressed two internal methods that you can do while holding your Lateral Half Dragonfly Pose for 3-10 minutes. The first internal method is remembering to breathe deeply and effectively. Draw in your breath deeply into into your belly. Hold this energy there for a second or two, then send this gathered "chi" or "prana" to the area that is feeling resistance. Tell the resistance that it is OK to let go. Notice any subtle shifting as your body opens and stay with this. Learn how to allow the resistance to slowly and softly dissipate when you don't force it! The second internal method is staying mindful of what is happening within yourself, your body, your energy and your emotions. Especially when you add self-loving-kindness! Resist the urge to fidget! The most benefit to this practice will occur when you stay with it and not move! As the saying goes, by BKS Iyengar, it's just when you think you cannot hold a pose any longer, is when the pose begins! The third internal method is to stay with the pose for a long period of time, as you watch your process. Typically, stay with the pose for at least 3 minutes. More is better, up to 10 minutes on each side. Nothing much happens if you move into a pose, and get bored with it quickly. The Yin Yoga poses are a wonderful way to practice having a still mind. If you practice the ability to still your body, you WILL still your mind as a consequence. The fourth internal method is to sense your subtle body and the energy meridians, of the Lung and Heart. I discuss fully, the qualities of the Lung Meridian, in the Quarterdog Pose, so please refer to it, for more information. The Heart Meridian, as you would expect, regulates your ability to feel nourished, have joy, inner peace, harmony and to develop warm and loving relationships with yourself and others. Practicing the Lateral Half Dragonfly Pose will strengthen both Heart Chi and your Lung Chi for better health. May your practice of this Lateral Half Dragonfly Pose nurture you, ground you and bring you more mindfulness and peace into your life! May you always strive to be your authentic self as you heal your body-mind-soul!